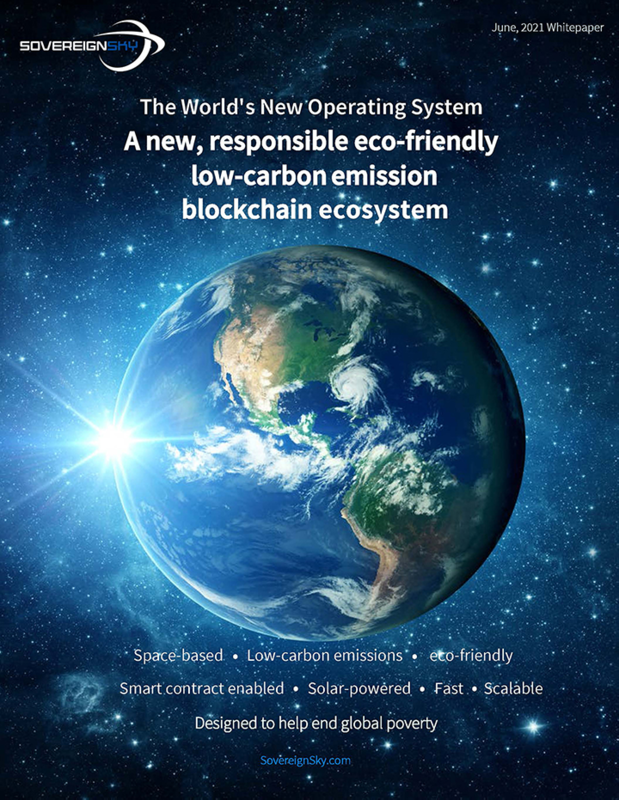 The Planet’s first space-based blockchain powering a new “Free World Currency” designed to re-distribute the world’s wealth to provide and protect our children, save and preserve our wildlife and aim to eradicate global poverty by 2032. Designed to re-distribute the world’s wealth. Eradicate extreme global poverty and help protect all children & wildlife by 2032. Create a new global Wi-Fi network with the SovereignSky space-based blockchain. Beam Sovereign electronic currency from space to villages and people in need in the third World. A blockchain for Fortune 500 companies, Hedge Funds, Family offices and corporations to use to create and run their own electronic currencies on. In November 2018, SovereignSky launched the first of 36 Sovereign satellites into orbit with its space agency, satellite manufacturer, orbit and launch partners. A total of 8 SovereignSky satellites will be sent into Low Earth Orbit around earth within 1 to 3 years in order to help eradicate poverty. The 8 SovereignSky satellites will cover Africa, India and the land mass below with a new, secure private internet network within 1 to 3 years to help eradicate global poverty. Boxes of StealthCrypto®️ phones, digital wallets, smart cards, and modems will be sent to people in need. These items are powered by our Space-Based blockchain, so donees can receive SovereignAid coin via the RUON application. Donors are able to communicate directly with their donee and see exactly how their donation is being used. RUON is the future of social media, a highly sophisticated social media, chat, business and banking application for Millennials, for the cryptocurrency generation and the world's unbanked. Stage 5: Global Wi-Fi Coverage. The funding, manufacture and orbit deployment of a total of 36 SovereignSky satellites will be sent into orbit around earth within 3 to 10 years and will cover the entire world in an encrypted, secure, and fast blockchain internet connection. We have developed ATM’s that will take cryptocurrency and exchange it for real money. Pairing SovereignSky’s secure exchange platform with SovereignSky’s ATMs conclusively generates an alternative world payment system and a global currency. This closes the gap on interactions among all nations, ultimately speeding up the eradication of global poverty in the most efficient way possible. Hybrid EOS Bitshares Blockchain Set in Space. An encrypted currency, deployed upon a wi-fi enabled satellite system to be beamed anywhere in the world. A currency which can be sent and used in the world’s remotest and poorest areas with no internet connectivity. A EOS Bitshares hybrid blockchain providing one of the most scalable solutions on and off the planet. EOS is one of the fastest blockchains in the world. Sovereign is one of the fastest blockchains in the world. A blockchain and Venture Capital fund dedicated to humanitarian causes and making the world a better place. These are apps like you find in the 'App store' or 'Google Play' which are built by developers on the Sovereign blockchain. Our structure and the Infrastructure. A concept or idea, however big, can be achieved by two things: The advancement in technology capabilities, and the will to solve that problem. Boxes are distributed by charities to villages and people in need throughout the world. Satellites connect to the Modems and the Antenna. SovereignSky's network of 36 wi-fi enabled Satellites will cover the entire world with a new, wi-fi encrypted, blockchain network connectivity. 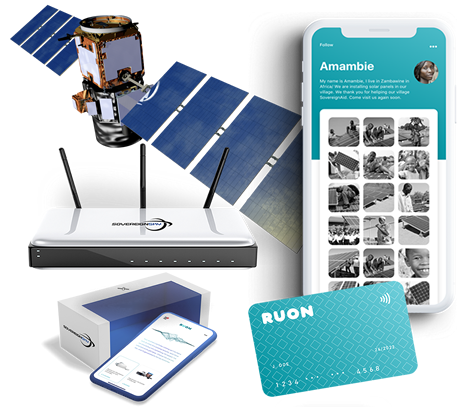 Modem converts the Satellites signals to wi-fi which the RUON blockchain phones pickup. SovereignAid and RUON cryptocurrency is sent from donors around the world to people in need discovered on the RUON App. The cryptocurrency of SovereignAid and RUON is then transferred the phone’s wallet to the crypto smartcard. We have developed SovereignSky based on our combined, unparalleled expertise in the blockchain market and beyond. It’s a space-bound solution to confer equal access to the world’s wealth to anyone on earth, regardless of their location, nationality and economic starting conditions. SovereignSky’s mission is to “Provide and Protect Our Children, Save and Preserve Our Wildlife and aim to Eradicate Extreme Global Poverty by 2032” - Timothy E. Burke, Co-founder SovereignSky. We combine a blockchain platform and token with a low earth orbit satellite network, based upon the government and academia-tested space technology of SovereignSky’s partner companies SpaceQuest, ISRO and Missionspace. This allows us to transcend jurisdictional and infrastructural limits that have been imposed by narrow-minded planning and self-serving objectives prevalent in most developed and developing nations on earth. Its location in the earth orbit enables it to offer equal access and equal opportunities to participants from all over the planet. It incorporates the concepts of “Building block(chain)s for a better planet” introduced by PwC and the Stanford Woods Institute. It’s a space-bound global currency designed to re-distribute the world’s wealth to help protect its people, preserve its wildlife and help feed its population, regardless of their location, nationality and economic starting conditions. We combine a blockchain platform and SovereignCoin token with a low earth orbit satellite network, based upon the government and academia-tested space satellites and technology of SpaceQuest, MissionSpace and partners at ISRO. SovereignSky will consist of a network of 36 wi-fi enabled Satellites which will cover the entire planet with a private, globally encrypted wi-fi network. Not a subject to any national jurisdiction on earth. Equal access and equal opportunities. RUON runs on a StealthCrypto® Phone which offers the core functionalities you would expect from a smartphone with military grade security on top and intuitive design, guaranteeing absolute privacy and familiar user experience. There’s are a number of ways in which a sufficiently refined blockchain system like SovereignSky can help solve the challenges passed by current developments. Today’s greenhouse gas levels may be the highest in 3 million years, rising to 412 parts per million in May 2018. Changes in precipitation, extreme storms, rising sea levels, coastal inundation and heatwaves directly affect people’s security, economic well-being and health. The Earth is losing its biodiversity at mass extinction rates. One in five species on Earth now faces eradication; this will rise to 50% by the end of the century unless we take urgent action. Biodiversity loss has a direct human impact – threatening energy, clean water and food supply. The chemistry of the oceans is changing more rapidly than at any time in perhaps 300 million years, as the water absorbs anthropogenic greenhouse gases. The resulting ocean acidification and warming are leading to unprecedented damage to fish stocks and corals. The world’s demand for water has grown by around 1% per year. By 2030, we may fall 40% short of the amount of fresh water needed to support the global economy as pollution and climate change affect the global water cycle. Around 91% of the world’s people live in places that fail to meet World Health Organization (WHO) air-quality guidelines. Around 7 million people die annually from exposure to air pollution – one death out of every eight globally. In 2017, the world suffered 710 geophysical, meteorological, hydrological and climatological “natural-loss events” – almost triple the number it suffered in 1980. These events caused approximately $330 billion in damages. We have aims but we also have the support of our awesome partners. The Planet’s first space-based blockchain powering a new “Free World Currency” which will provide and protect our children, save and preserve our wildlife and aim to eradicate global poverty by 2032. A space-bound global currency designed to re-distribute the world’s wealth regardless of their location, nationality and economic starting conditions. © Copyright 2019 SovereignSky. All Rights Reserved.